Nobody wants to spend all their time counting calories. Nobody wants to torture and starve themselves and many people dislike the thought of spending hours and hours performing gruelling exercise routines. The good news is. You can lose weight without having to do any of the above. Although exercise can help to tone your body, build your strength and keep you fit. Losing weight is all about your food intake or more importantly what you eat. Many people are constantly striving for a slimmer and healthier body, and many people have spent years trying everything possible to get a slimmer figure with little or no success. Being overweight can leave you feeling miserable and it can lower your self esteem and confidence. Sometimes people set about losing weight, but it is either short term or they feel like they are getting bigger and they are often left feeling hungry and unmotivated. There is a good reason why many people struggle to lose weight, and that is, the source behind most people's overeating is down to emotional issues, mindset and limiting beliefs. Unless you address the causes of your emotional eating then it can prove hard to lose the weight and keep that weight off. Most people's weight loss campaigns and efforts, usually involve a tedious and boring struggle of will power, a strict dieting strategy and calorie counting. But there are easier and better ways to lose weight, without all the struggle and inner fighting with yourself and your emotions. If you have been struggling and battling with yourself to try and lose weight or if you have been beating yourself up over your current body image. Then you will need a reprieve from all that inner conflict and emotional struggle which is partly responsible for your weight issues. We are programmed to eat, it is one of the most basic and fundamental human survival necessities and bodily requirements. Therefore, if you suddenly start to starve yourself, then you will be fighting against your natural instinct and compulsion to eat. Where many people go wrong is because, they start eating to deal with and cope their feelings and emotions. The secret to long term and sustained weight loss is to restore balance and to change all the things that throw your body out of balance like stress, limiting beliefs and emotional factors. Most of our bad thinking patterns, eating habits, compulsions and unhelpful behaviors are run by subconscious programs in our mind. These bad habits which are responsible for most people's weight increases and the reason why they struggle to lose the weight depend on neural networks in the mind. Once these networks have been created they will become automatic responses and behaviors that can cause food compulsions, cravings and emotional and bad eating patterns. This can lead to overeating and when you try to resist the urge to overeat, your brain thinks that overeating is what it is supposed to do, so it will try and force you to overeat. Trying to fight the urge and compulsion to eat by will power alone usually does not work and most people soon give in to the urge and compulsions to eat more than their body requires. These powerful networks and programs of the mind are automatic and sometimes people are not even aware of the amount of foods they eat, they just follow the lead set by their mind. The way to change these unhealthy and weight, increasing patterns is to make some new healthy neural networks so you give your mind new positive and helpful ways and patterns to follow. There are many subconscious and emotional reasons why you can put on weight and then struggle to lose it. Even when most people do manage to lose weight they find that they have to fight an even harder battle to keep the weight off, statistic suggests, that most people put the weight back on. You would think that losing weight is all down to cutting your calories and exercising, but if this was true then, why are so many people still struggling to obtain their ideal body size? First of all, you should not make your weight loss a struggle, it should not be something that you have to force yourself to do, and change begins in the head. Why most people fail to even start their weight loss programs is because they do not deal with their emotional problems and reprogram their mind and setting a blueprint for the mind to follow. Programming the mind is the starting point of a successful weight loss program. To begin with dieting is not a very good term, it tends to make you see food as the enemy that must be avoided especially certain foods usually the ones you enjoy the most. This can lead you to try and battle against your natural urge to eat and that is not a battle you want to create. You should still get some pleasure from eating, but you want to avoid tormenting yourself over what you feel like eating. Our brains want to guide us towards what it thinks we want and like, so if you have been eating lots of junk or high fat foods because you like the taste of them. Then, naturally your brain, which now thinks theses foods are good for you because they bring you pleasure, will try to push you into eating more of them. This is why people struggle to eat healthy foods because they have conditioned themselves that they are not very appetizing. To overcome this you need to re-condition your brain, so instead of trying to force yourself to eat healthier more nutritious foods that are good for you. Start to focus on the benefits of eating healthier foods, like how slim and good you're going to look, how fitter you're going to be, how much more confident it is going to make you feel and so on. The more you focus on how good the healthier food options are for you and how they make you fit and healthier the less you will crave for the high calorie foods. If you feel hungry then eat, because you should always eat when you're hungry, if you feel hungry it is because your body requires more energy and nutrition. By changing the way you think you will begin to make your weight loss goal more easier and more obtainable. One of the biggest reasons people put on the weight in the first place is down to emotional and binge eating habits. Most people who have problems with their weight have developed bad emotional associations and relationships with food. To successfully lose weight you first need to work on your emotional connection with food. Your mind and body are always searching for ways to give you pleasure and to try and make you feel good. When you become stressed your body and mind will start to look for pleasure, the ideal solution is to try and not to get too stressed in the first place, however this needs working on. Emotional eaters ways of dealing with their stress is to rely on food as their source of pleasure, they eat food to make them feel better or to pacify their negative feelings. But as a general rule, it usually makes matters worst, because it is usually high fat or high sugary content foods or alcohol that they crave for and it leaves you feeling guilty and miserable. If you are an emotional eater then your first task is to distinguish between when you're eating to make yourself feel better and when you're eating because you feel hungry. So start to recognize your triggers for why you're eating. Once you become consciously aware of the reasons why you're eating, then you can consciously step in and do something about it. If you're eating because you feel hungry then you need to eat, try to eat mainly healthy and nutritious foods, but you have not got to deprive yourself of all your favorite foods. Try to see and make good healthy foods as enjoyable and pleasurable foods, it is always sensible to consult with a dietitian or your doctor first. If you're eating because you're stressed or anxious then you need to recognize that your body does not require any food. This means that you need to replace the food with something else you enjoy as well as finding better ways to reduce your stress and relax. Sometimes we can eat too many of the high calorie foods for convenience, but the amount you consume are due to. Bad in the moment practices and habits that trigger an urge to overeat and activate all those craving or compulsion. To stop the over eating you need to break the habit, to break the habit you need to change the program running in your unconscious mind. People have been adapting to working around their obesity and leading normal lives to a degree, they still work and do most things slimmer people do but deep down they are not always happy. If you find yourself binge eating then more often than not there is an underlying emotional imbalance or issue which is behind the cravings and binging. The mind and body are connected and you can take advantage of this connection by using your mind to get your body to do what you want. People who have weight problem issues usually have a lot of negative thoughts about themselves and their body, which fuel their emotional and overeating habits and behaviors. These negative thoughts and negative self image will keep you stuck in a negative state and keep you overweight, eventually it becomes normal for your brain. But you can train your mind to help you rewire your subconscious mind, so you begin to restore inner calm and balance. Because by using the power of your mind through your thoughts and imagination you can guide your body to become what you want it to be. As Seen On TV: Celebrity Therapist & Best Selling Author Marisa Peer's Proven Weight Loss System. Marisa Peers is a specialist trainer and a highly successful coach to many of the worlds A list Celebrities, sports stars, performers and high achievers. Marisa is also one of the worlds leading transformational Hypnotherapists who has been proven to get fast results. Marisa has shown that transformation and change can happen fast because she has discovered that the brain is not as complicated as once thought. Your mind does what you want it to do, the only downside is, your mind does not know what is good or bad for you it just follows your instructions and the information it is fed. The majority of people have spent most of their life feeding themselves or being fed by others negative and limiting beliefs. To obtain quick and lasting transformation you have to get your mind to do what you want and hypnosis is probably the best way to achieve this. Most people subconsciously hold limiting and self sabotaging beliefs that they are not even aware they have. These self destructing beliefs that we have picked up throughout our lives carry on keeping us stuck and unable to become what we most desire to be. Marisa perfect weight loss program will allow you to let go of all your negative stuff and programming that is preventing you from reaching your ideal weight and then remaining at your perfect weight. Then it will let in all the good and positive stuff that will reprogram your mind to help you hit your perfect weight and more importantly, stay at the ideal weight forever. Change can be hard, because unless you change all your old destructive habits and self limiting beliefs, they will usually end up sabotaging all your efforts to lose weight. When you let go of your old negative and limiting beliefs, then you will be free to change. During hypnosis, your mind will be more willing and open to change allowing you to control your cravings and your body and your emotions. This weight loss program uses the power of your mind, so it does not require any strict diet routines, operations or vigorous exercise workouts. Hypnosis is perfectly safe, inexpensive, it is proven to work and nothing bad can happen when you're under hypnosis. The body will follow the lead set by your mind so when you visualize and think yourself thin, then your body will begin to match the thoughts and images in your mind. These days Marisa does a lot of television and radio work and she was voted the most successful therapist on Supersize vs. Superskinny and Celebrity Fit Club UK. 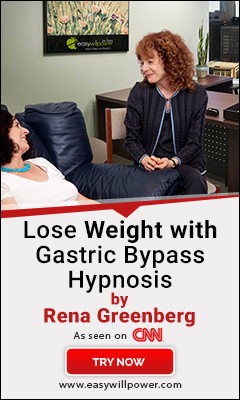 Normally you would have to pay a lot of money to have a session with Marisa, but thankfully she has created an inexpensive Perfect Weight Forever hypnosis pack that is affordable for everyone. So now you can have the professional guidance of one of the worlds most successful weight loss therapists without having to leave the comfort of your own home.